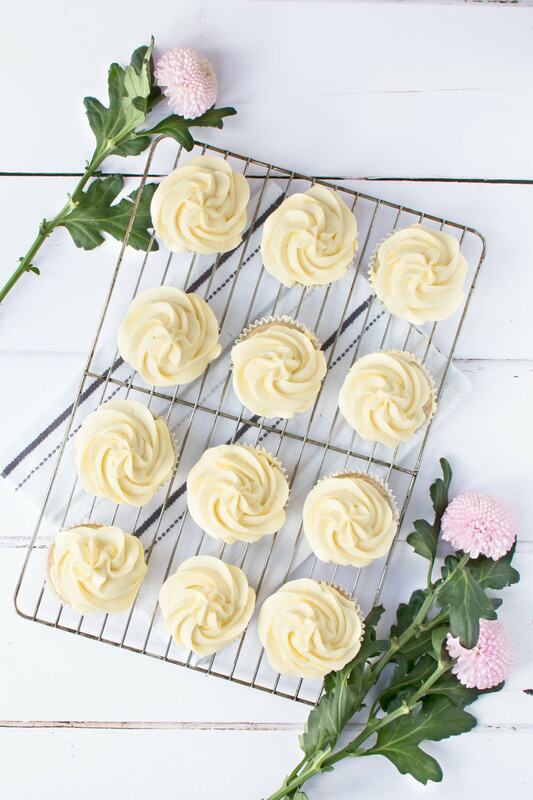 A couple of weeks ago I shared my recipe for vegan vanilla cupcakes. At the time I promised I would also share my vegan vanilla buttercream to top them with, so here it is! 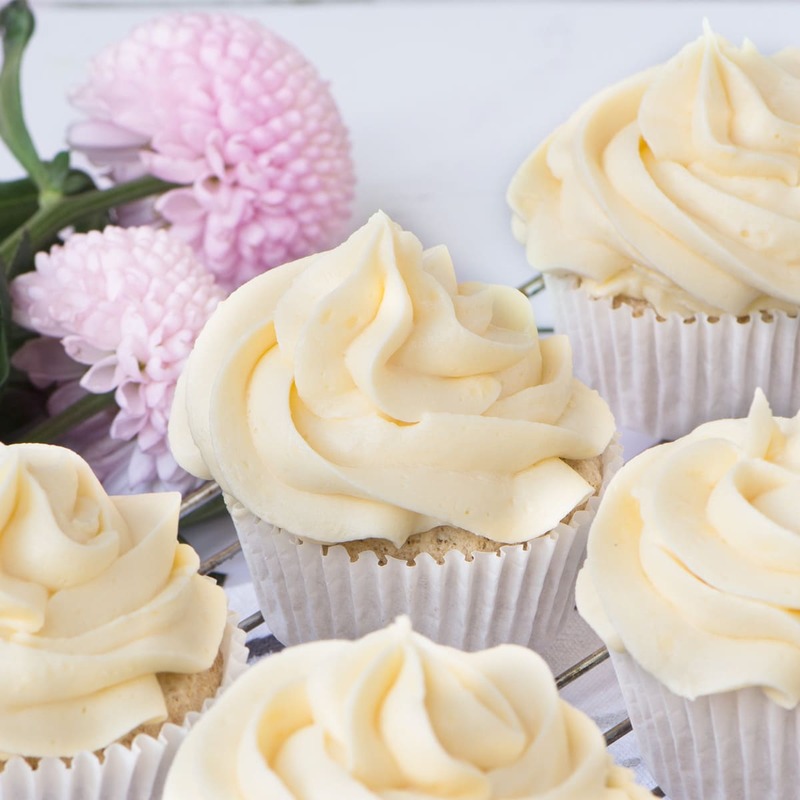 This buttercream is perfectly smooth and really easy to make. 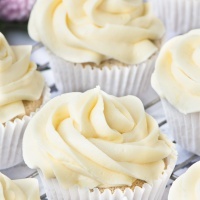 It follows a very similar recipe to my original vanilla buttercream with the butter simply being replaced with a dairy-free alternative (I use a combination of soft margarine and baking block). When I make buttercream I also tend to use a little milk to help get the consistency just right for piping. For this buttercream I’ve used almond milk as a replacement, but you could also use any other dairy-free milk if you need to avoid nuts too. Cut the baking block (125g) into cubes (about 1″). Put into a bowl with the dairy-free margarine (125g) and beat until soft (either by hand or with an electric mixer on a low speed). Sift the icing sugar (500g) and then beat it into the margarine/baking block – I prefer to add the sugar a couple of spoonfuls at a time as this makes it easier to combine and minimises the amount of sugar that flies out all over the kitchen. Add the vanilla extract (½ tsp) and mix until fully combined. 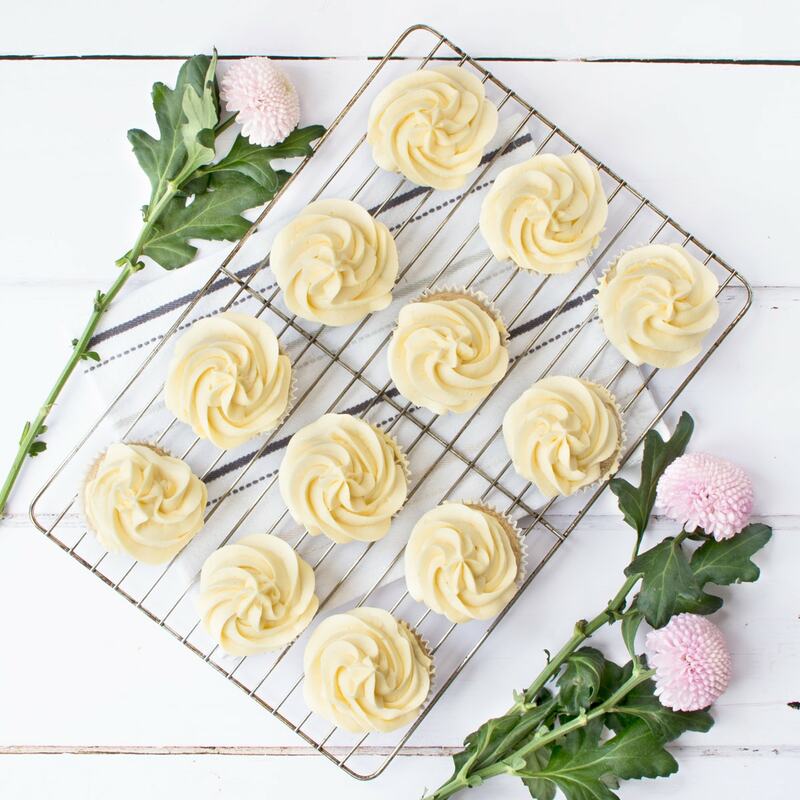 You want your icing to be a spreadable consistency (take a look at my recipe for vanilla buttercream for more about this). If it's a little too stiff then add the dairy-free milk (no more than ½tsp at a time) until it is your desired consistency. Beat in each addition of dairy-free milk fully before adding more. Now your buttercream is ready to use. 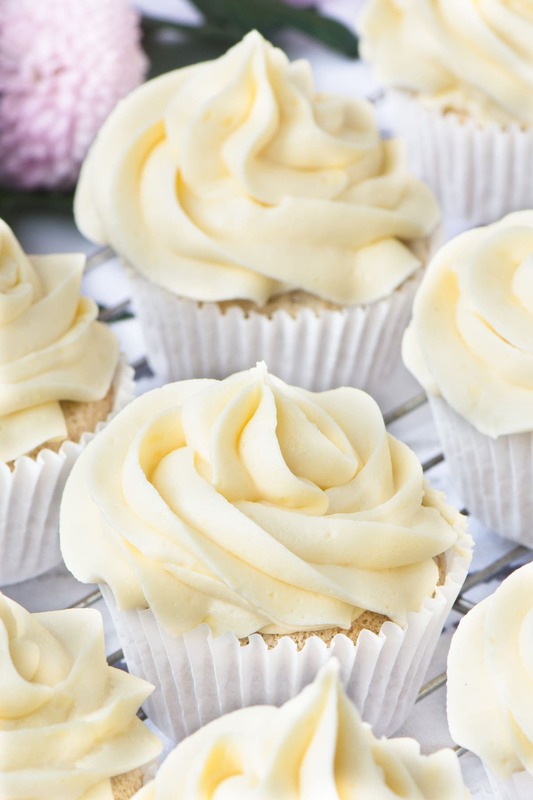 This recipe makes enough for 12 cupcakes or to cover and fill a 2-layer 20cm round cake. This recipe worked perfectly, thank you. I can’t think why that would have happened as I’ve never had any problems. Which brand of colouring did you use? How much did you add? Do you have a hand blender? It might be worth trying to give the buttercream a quick blitz with that if you have one as I find that it’s can even out slightly grainy buttercream. Stork isn’t dairy free it had buttermilk in it!! Can this be made into one cake, or just cupcakes? As the sponge is soft, it doesn’t really work as a bit cake – sorry. I’m working on perfecting a “stronger” sponge at the moment which hopefully I’ll be able to share soon. I’m not used to vegan baking so please forgive my ignorance but is it really double the quantity of icing sugar compared to fats? I know in standard buttercream it’s usually about the same. Hoping to use soon for my daughter’s party where some vegans are attending. In many buttercream recipes I’ve read it’s standard to use 2:1 but you can go down to 1:1 if you want (recipes do vary quite a bit). If you prefer your buttercream less sweet then you can make this with 1:1, it will still work well. I felt rather stupid after posting my comment as then I realised I was comparing to a chocolate buttercream recipe. Sorry. Small children make my brain turn to mush! I think a lot of the flavour come from the “butter” that you choose so it’s down to finding one you like the flavour of.